Abu Dhabi: Abu Dhabi National Oil Company (Adnoc) on Sunday announced partnership agreements with Italy’s Eni and Austria’s OMV in refining and trading, supporting the company’s ambition of becoming a major downstream player. “We commend the strategic partnerships between Adnoc, and OMV in refining and trading. The UAE provides solid and reliable foundations as an international investment destination for global partners,” His Highness Shaikh Mohammad Bin Zayed Al Nahyan, Crown Prince of Abu Dhabi and Deputy Supreme Commander of the UAE Armed Forces said on his twitter account. Bloomberg reported that Eni and OMV agreed to pay about $5.8 billion for a 35 per cent stake in the Abu Dhabi state oil company's refining unit. The transaction, which will bring proceeds of $5.8 billlion to Adnoc, is one of the largest ever in the refinery business, and was hailed as a “one of a kind” by Adnoc’s chief executive Sultan al-Jaber. The deal values Adnoc Refining at $19.3 billion. The companies also agreed to partner in a trading unit that will sell the refined products to international buyers. Under the agreement, Eni and OMV will acquire a 20 per cent and a 15 per cent share in Adnoc Refining respectively, with Adnoc owning the remaining 65 per cent. 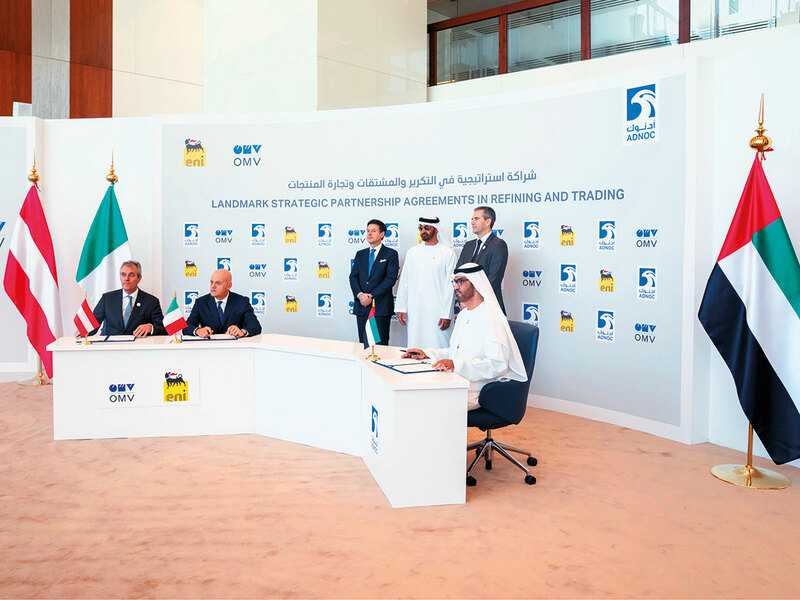 The partners will also establish a joint trading venture in which Eni and OMV will again own 20 per cent and 15 per cent, respectively, a statement from Adnoc on Sunday said. The agreement gives Adnoc Refining, which has a total refining capacity of 922,000 barrels per day, an enterprise value of $19.3 billion. OMV said separately that it would pay around $2.5 billion, while Eni said it would pay around $3.3 billion.